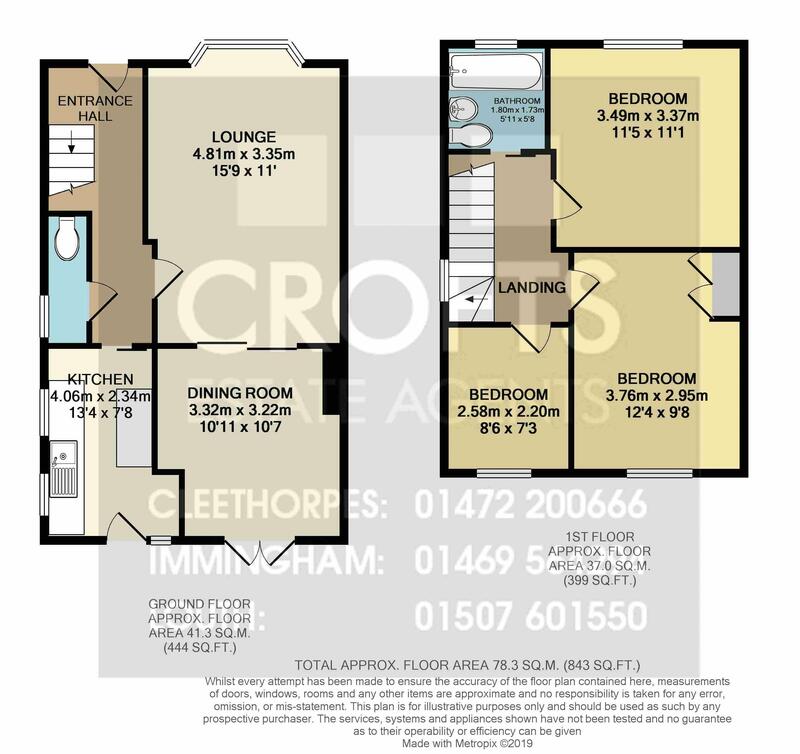 Crofts estate agents are pleased to offer for sale this spacious, semi detached property which is located within a sought after location within the town of Immingham. Having undergone a scheme of modernisation by the current owner, this property offers a good amount of living space and interested parties are advised to register their interest whilst still available. Located nearby to a variety of local amenities, internal viewing will reveal a lounge, dining room and kitchen with a cloakroom completing the ground floor. To the first floor there are three bedrooms, two being doubles and the modern recently fitted bathroom. Externally there are gardens to front and rear with off road parking. The property also benefits from double glazing and gas central heating. Entering into the property reveals coving to the ceiling, a radiator and carpeted floor. The cloakroom has an opaque uPVC window to the side elevation, tiled floor, partially tiled walls, a WC and the boiler is located in here. The lounge has a uPVC bay window to the front elevation, coving to the ceiling, a radiator and carpeted floor. Doors then lead to the dining room. The dining room has uPVC French doors to the rear elevation, coving to the ceiling, a radiator and carpeted floor. The kitchen has uPVC windows to the rear and side elevation and a door to the rear elevation with plumbing for both a dish washer and washing machine. There is a range of fitted units with a sink and drainer and complimentary tiling. The first floor landing has an opaque uPVC window to the side elevation and carpeted floor. Bedroom two has a uPVC window to the rear elevation, a radiator, carpeted floor and airing cupboard. The bathroom has an opaque uPVC window to the front elevation, partially tiled walls, a heated towel rail and vinyl flooring. There is a WC, basin and bath with an electric shower over. The garage has timber doors to the front and personal access door to the side. Externally there is a off road parking to the front and a driveway which continues down the side of the property. There is also a lawn to the front with shrubs and flower beds. To the rear there is a vast lawn with a path and flower beds. There is also a patio area and a greenhouse.